Get ready for the biggest Bollywood Friday of 2014 as three star-packed movies Queen, Gulaab Gang and Total Siyapaa are ready to lock horns at Box Office. 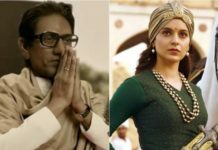 The best part in favour of the audience is that each of these belong to different genre which means that its a win-win situation for Bollywood movie goers as they have three good options to choose from. Overall its a Filmy Friday which may ends up long running Box Office drain. With two big actresses of 90’s Madhuri Dixit and Juhi Chawla coming face to face for the first time on silver screen expectations are bound to be good. But what works out of favor of Gulaab Gang is that the movie seems more of an artificial and synthetic one. Although the plot seems to be interesting but unnatural acting, weird action scenes and larger than life presentation makes it unintentionally funny. Gulaab Gang is releasing on around 1100 screens and is expected to get a below average start at Box Office. It doesn’t seems a movie for the multiplex audience and is surely to get bumped at multiplexes. 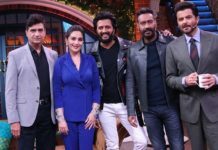 Although, Juhi and Madhuri may pull decent audience in mass centers and single screens but i am not sure whether they will be able to sustain on weekdays. As per our estimates Gulaab Gang will be a Box Office flop with first weekend collections of around 6 to 8 crores. It would be difficult for the movie to make 20 crores at Box Office. Kangana Ranaut is surely the most underrated actress of Bollywood. although she has been applauded by the critics as well as audiences for her acting skills but the actress is yet to give a big solo release at Box Office. With Queen, Kangana has a chance to prove herself and deliver her first big hit at Box Office. The interesting and out of box plot is what makes Queen a curious watch this Friday. 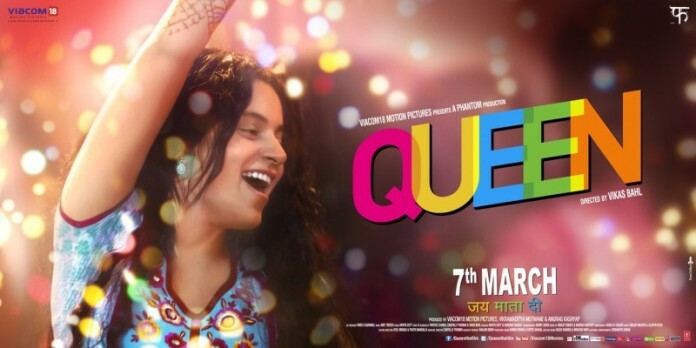 Queen has created enough buzz; thanks to its good music and feel good trailer. What works against Queen is that it has no appeal for the masses and well as single screens audiences. Kangana Ranaut is not a big star and it would be difficult for her to pull large audiences to the movie theaters. Queen Box Office opening will not be good but the movie can pick up on Saturday and Sunday mainly relying on positive word of mouth. The movie is releasing on 1100 screens and is facing fierce competition with the other two releases. Queen Box Office destiny primitively depends on word of mouth. We are expecting opening day collections to be around 3 crores which may rise to 10 to 12 crores in first weekend. Lifetime Box Office collections of Queen would be around 20 crores. Out of the three releases Total Siyappa has got the maximum screen space with 1600 screens. Total Siyapaa stars Asia’s sexiest man Ali Zafar and Yaami Gautam in lead roles. Total Siyapaa is written by none other than Neeraj Pandey who has earlier directed much applauded A Wednesday and Special 26. It’s a love story of a Punjabi Indian girl and Pakistani Boy. Altough the trailer of the movie is full of fun but the fate of the movie at Box Office seems to be in danger. Total Siyapaa’s release with other releases of the week Gulaab Gang and Queen may turns a big siyapaa for the movie. Although it has the maximum screen space but it is the least recognized one of the three. Total Siyappa is primitively a multiplex movie. The opening of the movie will be low as per our estimates and it would be difficult for the movie to survive the first week. We are expecting opening day collections of around 3 crores and that too with a positive WOM. The lifetime collections of the movie would be around 15 crores. It’s a Filmy Friday for cine goers so what are you waiting for grab a bucket of popcorn and pick your movie for this week. Keep visiting Blog to Bollywood for more Bollywood updates.